The international headquarters of Narconon utilizes the most effective drug rehabilitation program on the planet, developed by L. Ron Hubbard. Narconon’s mission is to eradicate the problem of drug and alcohol abuse internationally through effective rehabilitation and education. Using the proven approach to rehabilitation developed by L. Ron Hubbard, the Narconon program offers former addicts new life and purpose. Narconon graduates return to their families and communities drug-free and fully in control of their lives. Based on L. Ron Hubbard’s research, the Narconon program is unique in the field of drug rehabilitation. First, it uses a drug-free withdrawal procedure relying on vitamin and mineral supplements (along with techniques to ease the mental and physical symptoms of withdrawal) that enables the individual to cease his current drug use rapidly and with minimal discomfort. Following this, all drugs are then flushed from the body. This effectively eliminates cravings and flashbacks that can continue to occur years after the person originally took drugs. In combination with this, the individual does courses that give skills to handle life, so he will no longer turn to drugs or alcohol to solve his problems. Today Narconon operates more than 140 centers in 39 countries, and because of its unparalleled results, is looked upon as a leader in the field of rehabilitation. And while Narconon centers have helped free thousands of people from drug abuse so they can regain control of their lives, it’s a process that handles one person at a time. But by providing drug education services to hundreds of youth at a time, they can be prevented from taking drugs in the first place. Done on an international scale, we can create a drug-free generation. In fact, Narconon staffs have demonstrated that it is possible to reach hundreds of thousands of youths in a single year. Narconon drug education lectures are effective because they draw on Mr. Hubbard’s research to help young people understand how drugs can entrap them. With this understanding, they decide for themselves that taking drugs is harmful. Narconon also provides comprehensive training to other professionals and organizations who seek workable drug rehabilitation and prevention solutions. Answering an overwhelming demand for its effective drug rehabilitation programs, in 2001, Narconon opened a state-of-the-art facility in Oklahoma. With the capacity to provide treatment services to more than 200 students, it is the largest residential rehabilitation facility in the world. 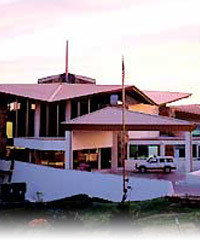 The establishment, known as Narconon Arrowhead, is also home of the organization’s International Training Academy, where the successful drug rehabilitation methodology — both its administrative and technical expertise — is made available to other professionals, drug treatment organizations and governments. Narconon Arrowhead is the driving force behind a new campaign to eradicate drug abuse on an international level, and has the means to free thousands from the scourge of drug addiction.